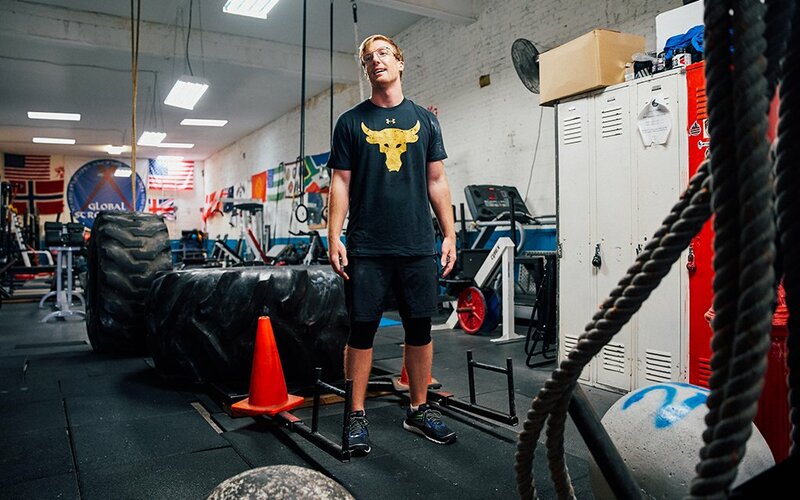 This is part of 31 Days, an ongoing fitness series in which a regular guy takes the fitness routines of celebrities and athletes — from Dwayne Johnson to Mark Wahlberg to Arnold Schwarzenegger — for a month-long test drive. Do the regimens live up to the physiques of the superstars behind them? Only one way to find out. 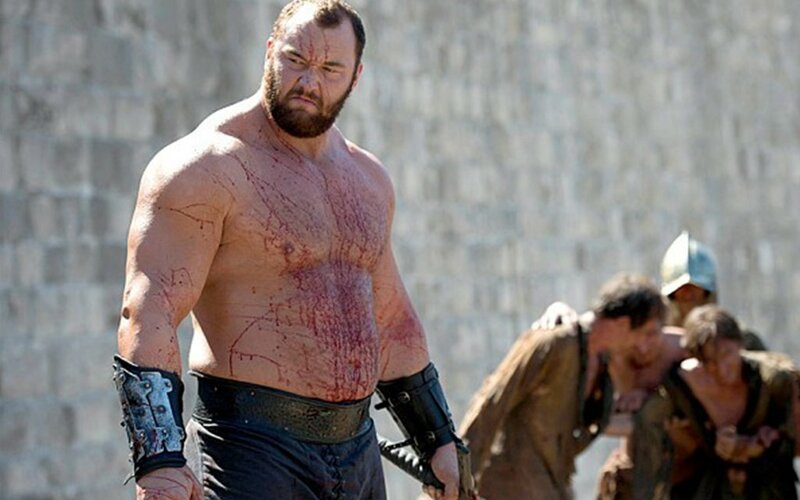 And, of course, The Mountain, who once crushed another man’s skull with his bare hands. 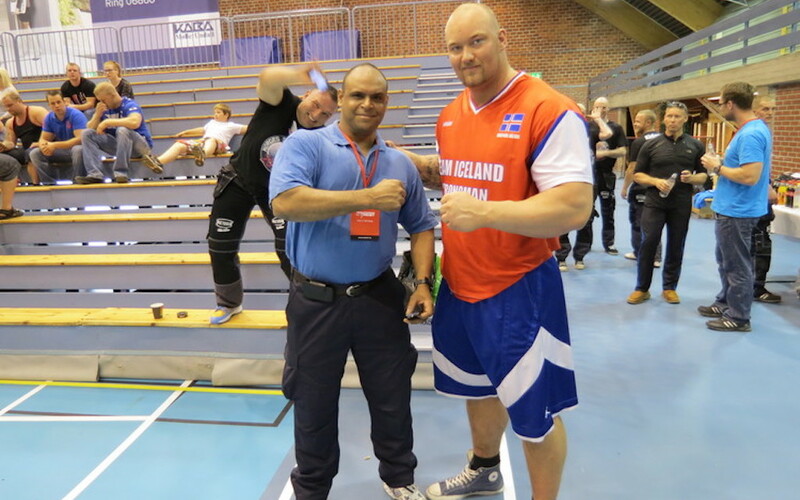 Given that, it should come as no surprise that Hafþór Júlíus Björnsson, the 28-year-old Icelandic actor who plays The Mountain, is a professional strongman. He stands 6’ 9” and weighs 416 lbs., according to the World’s Strongest Man competition, where he recently finished in 2nd place. I, on the other hand, am 5’ 11” and weigh a bang-average 183 lbs. But with Game of Thrones nearing its end, I wanted to use the show’s most physically imposing character as a subject for my fitness tests. 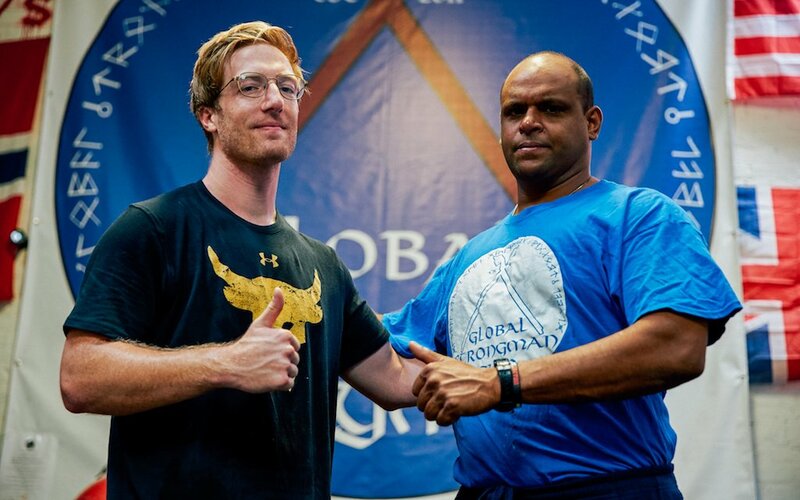 To get an authentic experience, I went to Global Strongman Gym in Brooklyn, New York, the only strongman specific gym in the city. Owner Hans Pirman is the sole trainer and a competitor himself. He’s also hosted Björnsson. Below, the details of my four-week plunge into a world of stone lifting, tire flipping and illusions of one day becoming a Viking. Walking into a new gym is always intimidating. At Global Strongman Gym, this was comically true. The giant metal doors were sufficiently medieval for my purposes, and the aroma brought me back to high-school football locker rooms. My greeting — the expletive you see above, as delivered by a perspiring strongman-in-training — sealed the deal. The 48-year-old Hans Pirman walked over. He is built like an atlas stone in that he seems unmovable, a Fezzik in The Princess Bride type. After asking if I had eaten lunch, he took me through a series of deadlifts, squats, farmer’s carries, tire flips, atlas-stone lifts, log presses and a sandbag carry. The focus was on form, but Pirman was quick to add weight when he saw I could handle more. 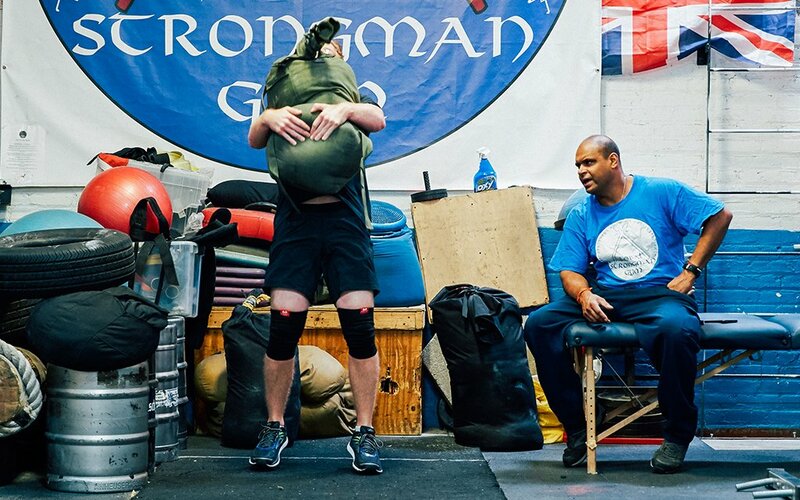 It was during the sandbag carry that I got my first glimpse of the essence of strongmen. Without him, I would’ve quit. Instead, I bellowed involuntarily and wrenched the bag to my chest, stood up, leaned back and hoofed it down the length of the gym and back. Eat more. I’d need to eat 5-6 meals a day to grow and progress. I couldn’t upend my life to eat perfectly portioned meals, so I chose to forego tracking nutrients in favor of simply getting in that many meals. Invest in knee sleeves. I’ve never felt confident in my knees since tearing both of my ACLs years ago. Sleeves and other compression gear are commonplace in strongman and other strength sports, but as a casual partaker, I had never used them. As I left that first night, my forearms bloodied from the atlas stones (not unlike Jorah Mormont), the giant firefighter called out, “Good job today, come back.” Sure, I said. Exercises: Deadlift, bench press, squat and overhead press. Additionally, decline bench leg raise, decline bench sit-up leg extension, seated calf raise, wide-grip lat pulldown and the good old-fashioned pull-up. 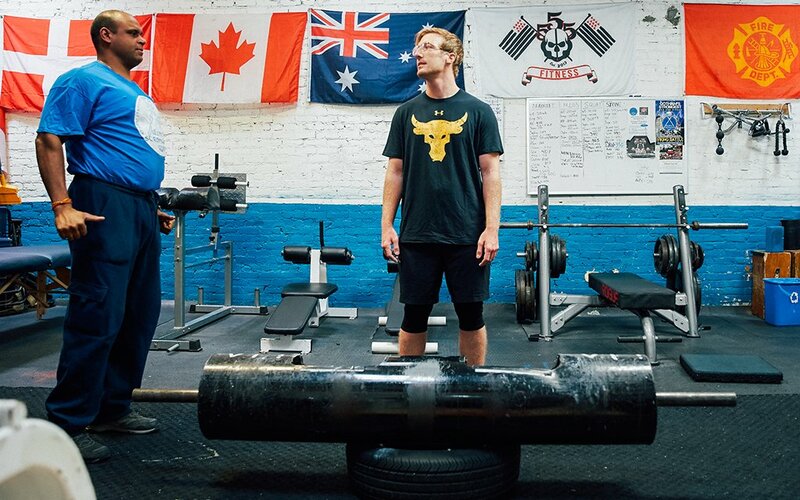 The deadlift was my first experience with chalk, which sat in a bucket on the gym floor. I covered my hands with it before stepping up to the barbell that Pirman had loaded. 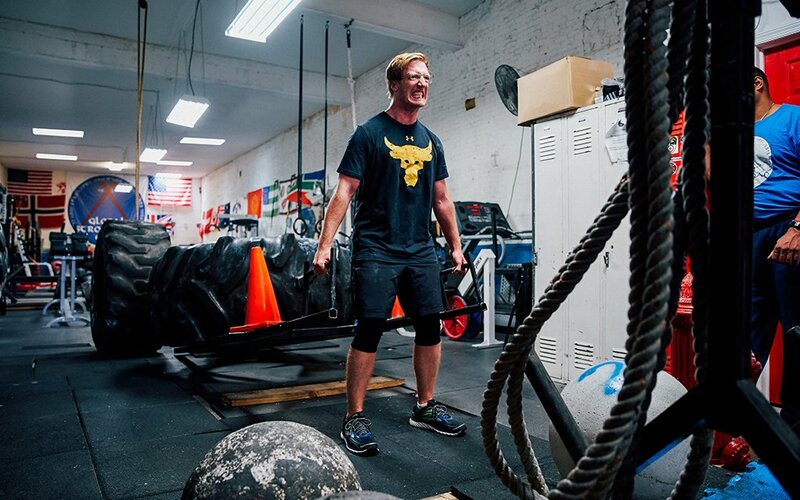 He talked me through the proper form — shins at the bar, arms long, chest up — and had me switch my grip from standard to one-hand-over, one-under during separate sets. I progressed through weight loads relatively quickly, partly because Pirman was there to keep me aware of the proper form, but also because he was spotting me. Throughout the process, Pirman’s fundamental understanding of how humans can and should lift extreme amounts of weight was critical. Case in point: at the squat station during my fourth session, Pirman loaded the bar to the heaviest I had attempted yet. He spotted, making sure the bar was sitting not in the high-bar position on my shoulders, but in the low-bar, on the rear deltoids. On my last rep, the pressure at the bottom instinctively made me tilt my head down. 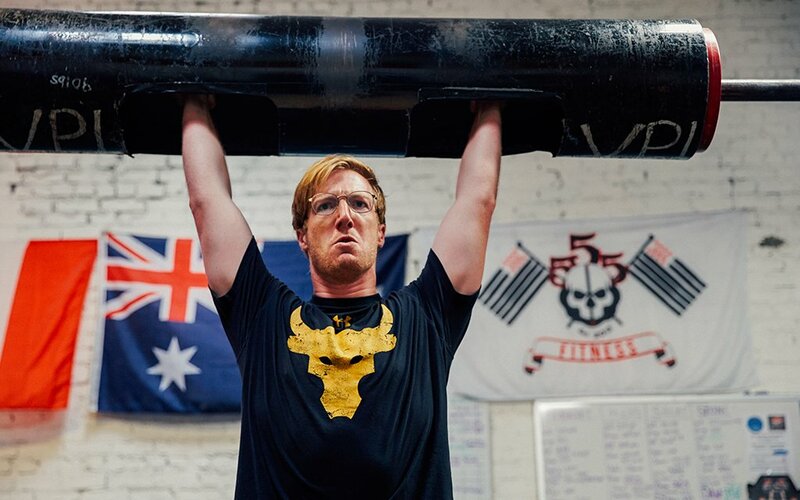 One of the most common questions I fielded while training like a strongman was, “How sore are you?” And the truth is: no more than any other workout. Yes, after the first day I walked to the subway at Barclays Center in a stupor trying not to pass out, then splayed out in my kitchen and stretched every muscle I could find. But once I began eating those five daily meals and monitoring my water intake, my muscles felt full and resilient less than an hour after the sessions. These exercises can be divvied into two groups: ones that look difficult and are, and those that don’t look difficult … but still are. The second group includes the sandbag carry, log press and farmer’s carry. 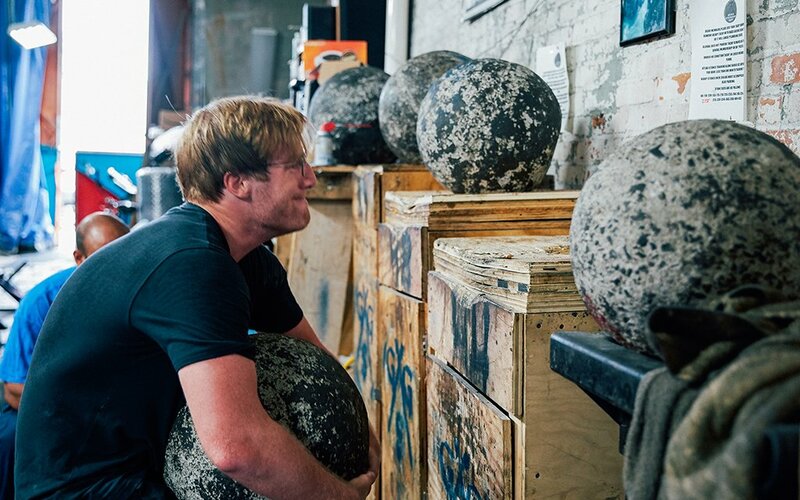 The most visually appealing as a spectator — and most severe as a participant — were the tire flip and atlas stones. I started the first day with a 350-lb. tire, but moved up to the 450-pounder the next session, and stayed at that weight for the remainder of the month. Every time we came back to it, Pirman had to remind me to take a wide grip at the bottom to get it up to a 45-degree angle, then use a full body press to turn it over. Frankly, I was looking forward to the atlas stones the most. But as Pirman states in the quote above, these are no toys — they’re rough-hewn boulders that look like they were fished out of a Norwegian sea. I started with a 100-and-change-lb. stone to test it out. On the second day, Pirman moved me up to 155 lbs. I bent down, squeezed it and tried to lift it up onto my thighs, but it barely budged. So I stood up to breathe and reassess, which Pirman took as a sign of giving up. “Come on!” So I tried again, howling and red in the face, but it moved even less. “You’re gassed,” he said. I waited five minutes, got some water and caught my breath. When I tried again, I put it up. 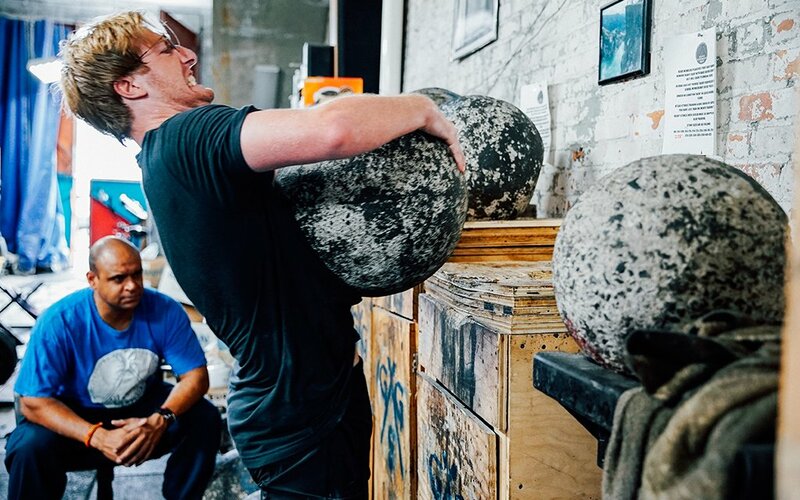 This moment highlighted another misconception I had about strongman: while it is the most intense heavy-lifting sport, it also requires a great deal of composure. That may be what most separates strongman from high-intensity interval training or CrossFit, which both promote nonstop expenditure. 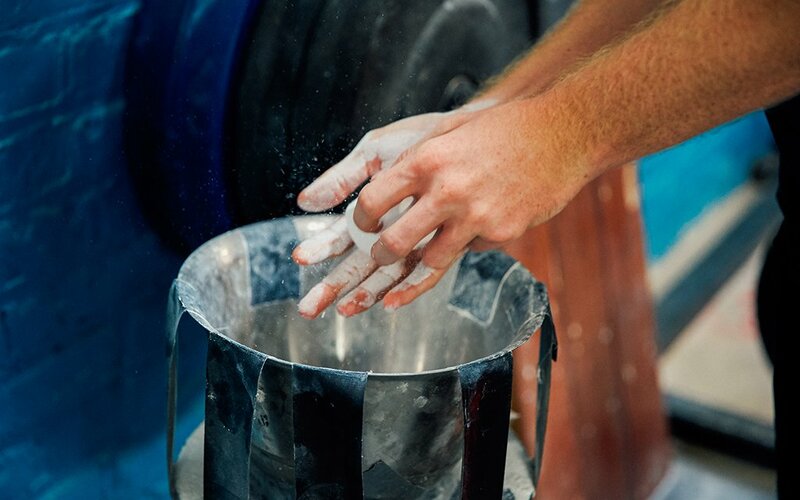 Neither of those disciplines imprint themselves on your body the way strongman does: bloodied forearms, calloused hands. 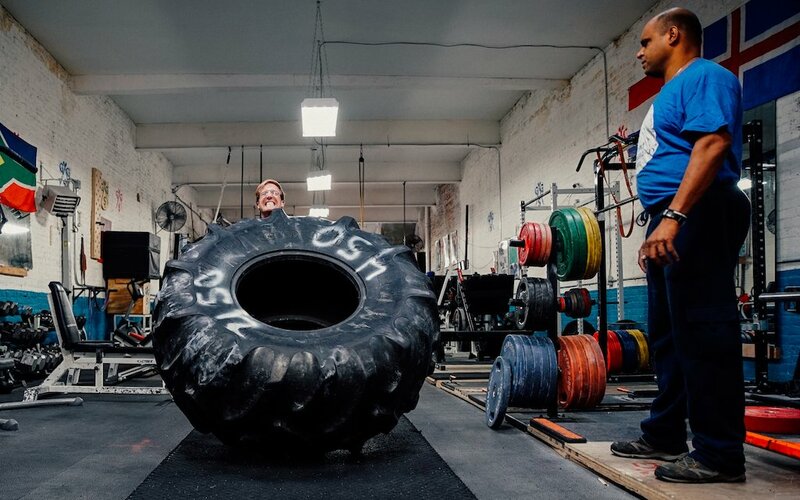 The imperfect nature of strongman weights builds mental toughness as much as it does physical strength. As Pirman likes to tag on his Instagram, this month was a lesson in #strongnotskinny. I gained 10 pounds in a month, up to 193, mostly in muscle. If Pirman had not harped on the topic of food intake, asking me how often I was eating at the start of every single session and mentioning it every single time before I left, I would not have had the same results. If you want to see strongman in action, Pirman is hosting a competition at his gym (987 Pacific Street, Brooklyn) on October 28th. If you want to train with him or check out the space, you can get in touch with him on his website. Don’t be shy to call.